The Red Jacket from American manufacturer pump Gilbarco Veeder-Root is built as submersible multi-stage centrifugal pump, designed to pump LPG liquid. The RJ pump is able to pump butane, propane or any mixture of the two. The Premier and Premier MidFlow are designed for standard LPG refueling applications with low to intermediate flow requirements, whilst the Premier HiFlow is intended for high capacity installations such as commercial vehicle fuelling facilities, as a source for multiple dispensers and bottle filling plants. * at 15°C, mixture of 50% propane, 50% butane. ** Remarque: All models of the pump must never be allowed to operate at less than 4 bar differential pressure. Operation without interruption of RJ running – it has its own inner by-pass. Installation in the tank for greater flexibility in LPG filling station design. Most cost-effective solution (economy of material, installation, lower construction costs). 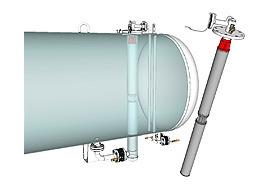 It is necessary to secure the pump from operation “on dry”, where in the tank there is no LPG. We recommend a minimum of double protection. We have system of monitoring of LPG level in the tank and system phase sequence with Emotron. These components are placed in the switch-board. Third protection could be installation of pressure transducer on the delivery pipe of the pump.